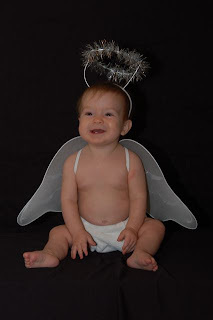 I couldn't find any cupid wings, so I went for the angel wings instead. Isn't she precious? She's suffering the most from this flu. Her fever just won't stay down for more than an hour or so. I've started alternating Tylenol and Motrin in hopes that she can have some relief. I know that fevers help rid the body of illness, but she is just SO miserable I can't let it go. If it was a low fever, I'd feel differently, but she'll go up to 102/103 between doses of medicine. She's sleeping on my lap at the moment, and I don't dare move to disturb her. Thankfully, N is not as sick (although he looks pretty pitiful as well.) Between Benadryl and Tylenol, his symptoms seem to be under control. I'm sorry you guys are so miserable! She sure looks cute there, Melanie. I could eat her up! Natural diapers too? I'm impressed. Oh she is just so incredibly precious!! !